Pip and Sam first met in 2009 when they were just teens at Canterbury College. They became good friends over the next three years, but they went their separate ways for university, Sam in London and Pip in Brighton. However, they never forgot each other and one cold February night, Pip scored some liquid courage and gave Sam a call demanding that he come see her in Brighton. Sam dutifully made the hour journey to Pip and they had a night on the town, which culminated in their first kiss. The months that followed involved many train journeys between Brighton and London until they finished up their degrees and then Pip moved back home to Kent and Sam stayed nearby in London. A few months later they added their puppy, D'Artagnan, to the tribe and the twosome became the three musketeers. You can find the bride on Instagram @pipx143. Their wedding hashtag is #samandpip17. Around Christmastime 2015, Sam and Pip awoke to the disheartening news that their car had been broken into and the thief absconded with the presents they had stored in the trunk. Pip was understandably upset and decided to take D'Artagnan for a walk to clear her head while Sam sorted things out with the police. After handling the report, Sam caught up with Pip to comfort her and pulled a small box out of his pocket. “At least they did not take this,” said Sam before revealing Pip’s dream engagement ring. 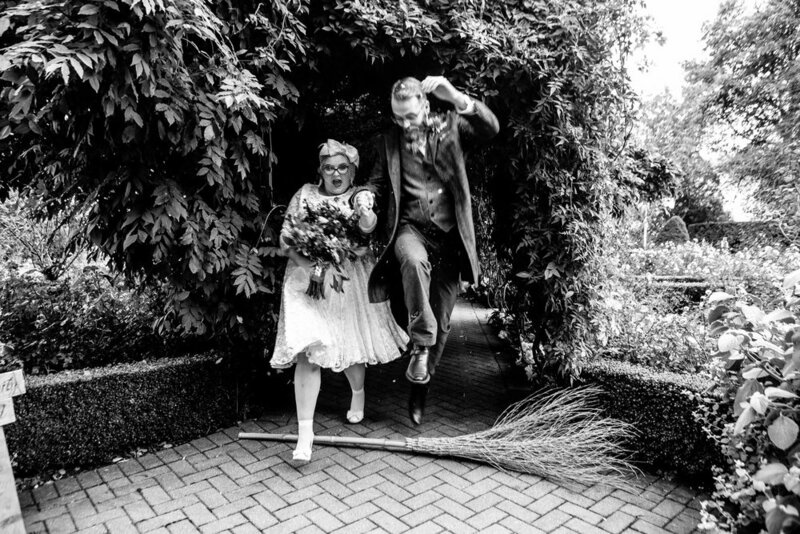 The couple married on Friday the 13th in October of 2017 at the Old Kent Barn in Swingfield, Kent in the United Kingdom. 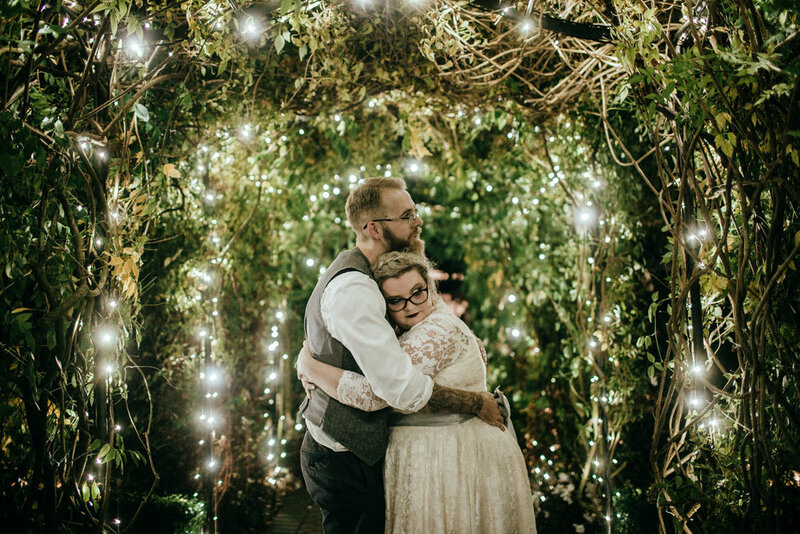 They saw a few venues, but Pip had her heart set on a rustic barn setting. Ironically, when they visited the Old Kent Barn, it was love at first sight for Sam, but Pip was not quite as sure. However, as they walked the grounds and Sam painted a picture of the day Pip was convinced and they made their deposit. 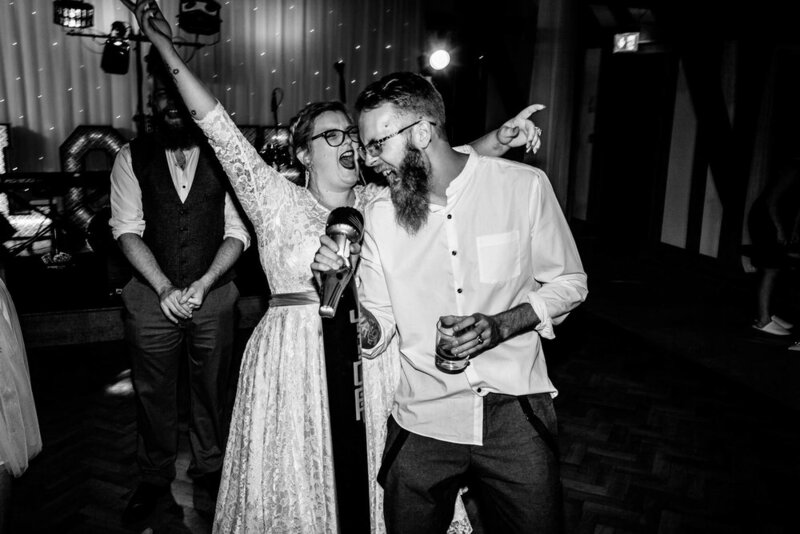 With a guest list of 100, the couple spent the bulk of their $20,000 or £15,000 on their venue and food, leaving about $7,000 or £5,000 for their outfits, decor, flowers, band, photography and all of the other incidentals. To keep everything under budget, Pip and Sam made a lot of the decor themselves, including their amazing crescent moon photo booth backdrop. “Sam and I are ‘making people,’” explained Pip. 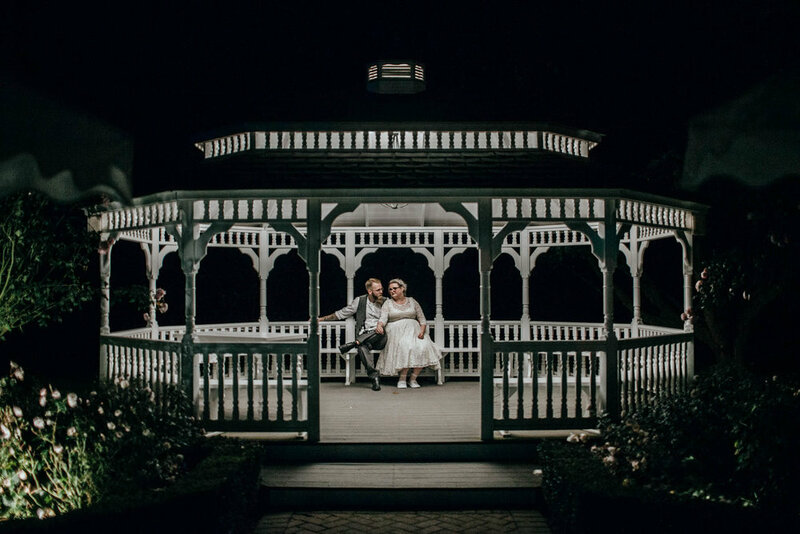 “He is a theatre carpenter and I have a background in prop making so we made our photo booth our ‘big make.’” A good friend of the couple, Dom Kelly, supplied the camera and printer for the photos and their guests used it non-stop throughout the night. 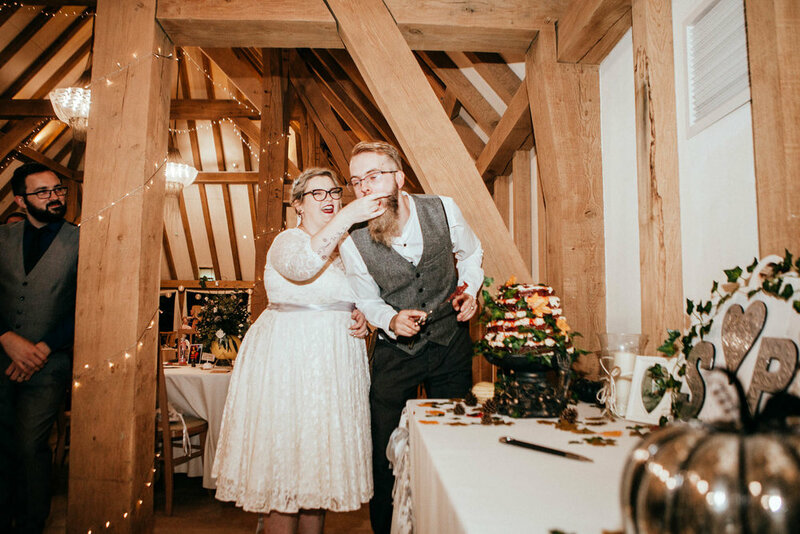 Pip and Sam are big Halloween junkies, but since they were already having a Friday 13th wedding they did not want to be predictable and have a Halloween-themed wedding, especially since they already throw an annual Halloween bash. At the same time, it was important for Pip not to loose their spooky side so her and Sam made a wedding mood board to get an idea for their aesthetic and make a cohesive design plan. Their final vision includes lots of gray, silver, and cream mixed with autumn flowers, white pumpkins, and a few skulls for flair. For her bouquet, Pip gravitated to a more untraditional, wild mix and used pheasant feathers, dried poppy seed heads, thistles, eucalyptus and berries along with more foliage to achieve her vision. Their venue supplied their linens and tablecloths so they did not have to worry about that detail. They set up additional tables around the periphery for their guest book, wish jar, and post box card box. 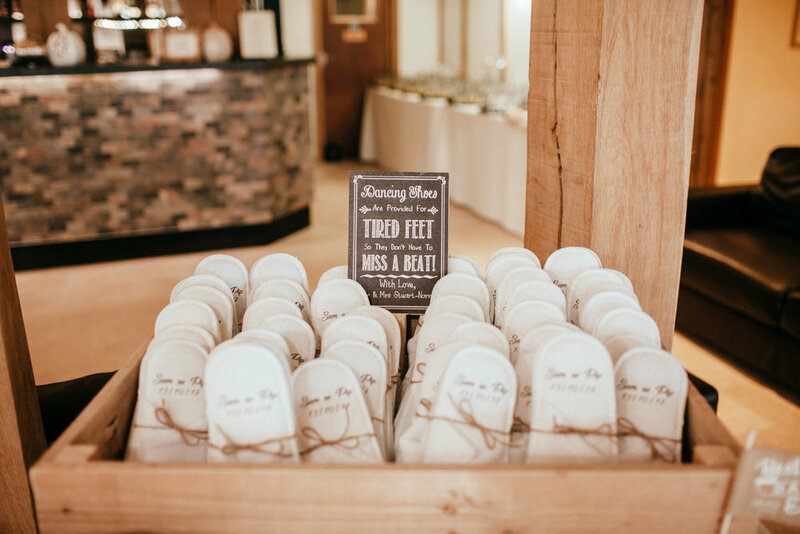 For a special gift for their guests, they also set up a table full of slippers, which Pip carefully adorned with their names and the wedding date. Pip and Sam both wanted to incorporate a lot of handmade elements, so they hung a water color portrait of themselves made by artist Kirstie Marshall and they had a sweet table gifted by their friend, Claire Bateman. For their table plan, they used a beautiful simple poster. The table names were classic horror movies like Dracula, Bride of Frankenstein, and the Creature from the Black Lagoon. Their center pieces were flower-stuffed pumpkins, which they purchased from a local farm - Chilton Manor. Pip found her dress through a lucky stroke of fate. She was meeting with her bridesmaid and her mother to go shoe shopping when she saw a beautiful, lace dress in the window of the small boutique shop Beretun Designs in Brighton. Pip pointed it out to her bridesmaid, Devon, who encourage her to go have a look. Pip hesitated because she doubted that they would carry her size - UK size 18 or US size 14. They went in anyway and Pip asked the shopkeeper about her dream frock. The shop actually carried her size in store and they advised that they also had a seamstress on retainer who could fit anyone. 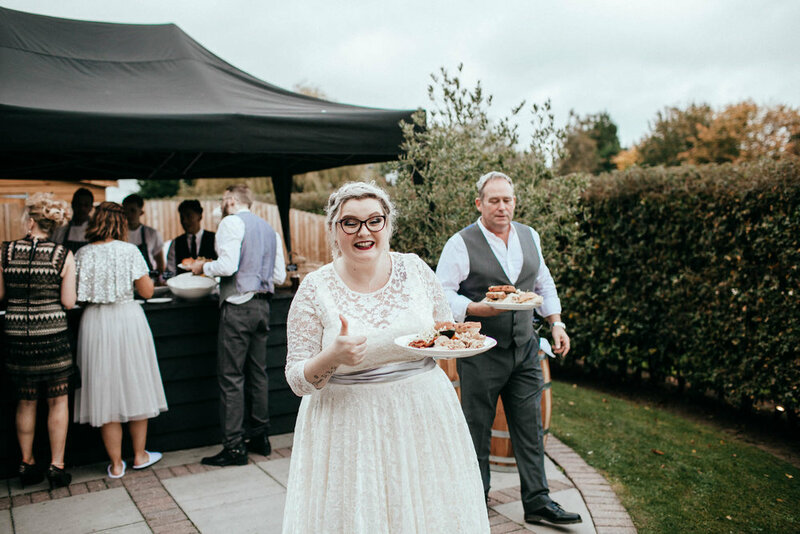 “I was used to having to try one or even three times bigger in wedding dresses* so I asked to try their biggest size, but the lady said ‘no, no I’ll get your size’ and it fit like a glove,” said Pip. 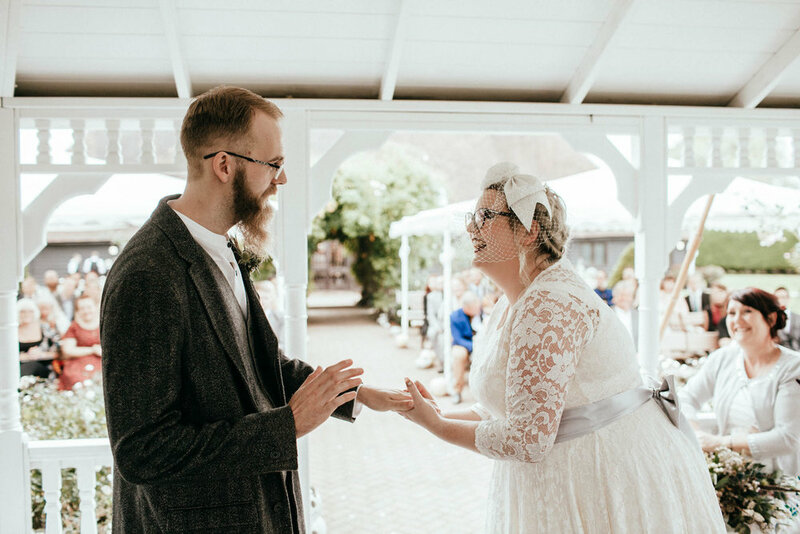 “I loved it so much, however, I was to scared to ask the price, as I didn’t have a massive dress budget, but it was only £280!” Pip did make a few alterations, like adding the 3/4 length sleeves, but they were minor changes that did not break the bank. The biggest challenge for Pip was to focus on herself and stop trying to make everyone else happy. The seating plan and the guest list also was particularly hard for Sam and Pip because there were so many more people that they would have loved to have been able to invite. Sam said his favorite part of the day was the ceremony itself and Pip’s entrance in particular. He really like that everything was relaxed and fun, but still very them even though they followed a traditional ceremony. *Ready-wear sizing versus bridal-sizing is very different. 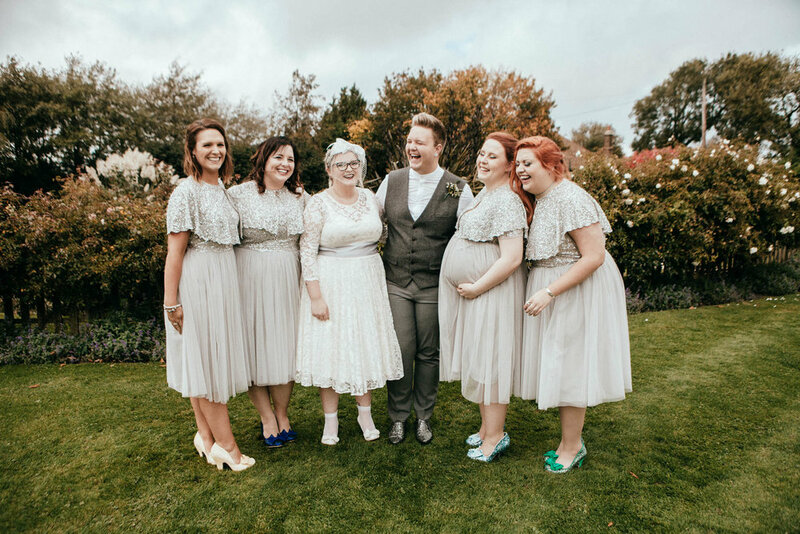 Wedding gowns can be 2, 4, 6 or more sizes bigger than your normal dress size. It’s nothing to stress about!